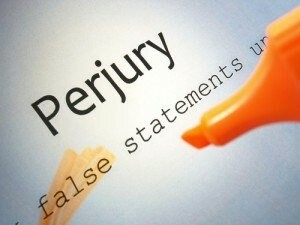 How Can I Prove Someone is Lying at My Trial? Central to almost every criminal case is the issue of credibility. The defense is almost always challenging the testimony of a police officer, an expert witness or an eye witness to a crime. Not every alleged crime is caught on tape. Sometimes the defense and the district attorney have to rely on witnesses to establish and prove their cases. One of the most common questions I get from prospective clients is how can I prove someone is lying at my trial? One of the first things defense lawyers do when they get a new case his review the police report. Usually a witness to the incident is identified in the report. However not every witness is identified or even mentioned. Please officers tend to include statements from the witnesses who support the police officer’s’ belief that the alleged criminal activity occurred. Not all officers are thorough however. Some of them simply ignore exculpatory evidence or fail to investigate the case fairly. Most criminal defense lawyers will not only interview just the witnesses referenced in the report they will also go out and try to find more witnesses. Knocking on doors of neighboring establishments or residences has helped us secure acquittals on countless occasions. Sometimes our client identifies the witness for us. Other times we have to find these people on our own. Nevertheless, aggressive investigation can often show that a witness presented by the prosecution is not telling the truth. Many witnesses, particularly civilians, provide only general information to the prosecution. For instance they might say I saw the defendant hit the victim. Nothing special there. However, when pressed for detail most witnesses offer very little. Using this example, a follow up question might be “Well, where exactly did this happen? Were there any buildings around? Where were you when you saw this? Witnesses do not want to look stupid so sometimes they fabricate the answers to these follow up questions. Photographs of the crime scene might cast doubt on these details. For instance, a witness might put himself on a street corner that obscures his view from the crime scene. Showing him a picture and asking how he could see what he said he saw will cast doubt on his entire testimony if the evidence shows that he could not have seen that from where he was supposedly watching. Jurors want to sink their teeth into something tangible. They invite the challenge of determining witness credibility. Photographs give them the tools to question witness testimony. We recently tried a drug trafficking case that involved the execution of a search warrant on a home where our client would sometimes stay. The police claimed that during the search our client led them to the drugs and admitted that they were his. One of our witnesses testified that our client never spoke to the police at all during the search. We correctly assumed that the officers would say that no one was around when our client confessed. We prepared for this. We had pictures of the home and a scaled drawing of the interior of the property. Through this evidence we clearly established that it was not possible for our client to have a private conversation with the officers. Rather, if he did speak to them it would have been in front of other witnesses, none of whom corroborated their testimony. The jury disbelieved the officers and we won the case. Attorney Stephen Neyman has been defending criminal defendants for nearly three decades. Our results are unmatched. We encourage you to call our office with questions about your criminal case. We know that we can help you. Call us at 617-263-6800 or send us an email.